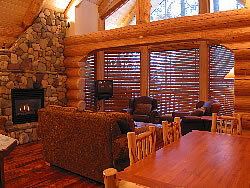 Snow Creek Cabins are a classic Canadian log cabin design tucked in the Fernie Alpine Ski Resort woods above Snow Creek Lodge. This Fernie ski accommodation is conveniently located slope side, and guests enjoy full access to all amenities at Snow Creek Lodge. Relax amidst the early-Canadian architecture featuring handcrafted log and stone detailing, hardwood floors throughout and wrap-around decks or balconies. Enjoy the seclusion of the luxurious Snow Creek cabins and be the first out on the ski slopes in the morning! Contact us for more information or to make the Snow Creek cabins part of your Fernie ski holiday.